It’s July 4th, which means something slightly different over here in the UK. We’ve adopted the day and called it Independents Day instead, a day to celebrate the many unique & wonderful independent shops up and down the country. To celebrate this we’re doing this run down of our favourite independents in Leeds. One of our neighbours in the lovely Leeds Corn Exchange, the owners are lovely & friendly. Claire (who has now had a change in career after many years serving up gorgeous vintage fashion) even let me (Tom) and my girlfriend check our uni results on her laptop while we were fitting out the shop – so that’s definitely a bonus! They have a wide array of clothing which brings on strong feelings of nostalgia, but at the same time looks great. From vintage shirts, to jewellery, bubble bags, glasses, and more… There’s something for everyone here. Check our their shop & Instagram below. I’m a drummer myself, I played all through school and college, having to stop at uni due to housemates & limited space – so I love it here. Stephen stocks all the usual brands but also has a great selection of smaller brands in stock including Dream Cymbals (aptly named due to how dreamy they sound), and a funky new bass pedal that you an adjust the angle of to fit your playing style for more comfort – he’s the first stockist of this in the UK! If you like to hit things, be sure to pop down and see what Leeds Drum Centre has on offer. I can’t claim to know much about nails myself, but my girlfriend loves it here so that’s a plus for me. Laura is our next door neighbour in the Corn Exchange, so we hear lots about a thing called Shellac which is supposed to be brilliant and Laura does it. Check our Ragdoll Nails on Facebook & Instagram below. We do venture outside of the Corn Exchange, don’t worry. Mrs Atha’s is one of my favourite places in Leeds. Lovely tea, gorgeous cakes, and a really nice relaxing shop fit. If you’re stuck for where to get a brew I would highly recommend here. Just off Briggate near to Little Tokyo, there’s no excuse really – it’s just around the corner and out of the way of the hustle & bustle. Mrs.Atha’s is an independent family run coffee shop with an emphasis on good produce and traceable provenance. With the help of some wonderful suppliers we aim to provide our customers with the best experience possible in an inviting, informal and hopefully interesting space. Every detail in the shop has been carefully selected to reflect what we feel is important both gastronomically and aesthetically. We hope you like it. This little gem is just down the road from Leeds Market, opposite the Duck & Drake. I went here recently and for a meal for two people with a couple of beers came to about £20 – and you wouldn’t mind paying £30+ for it, it’s that nice. 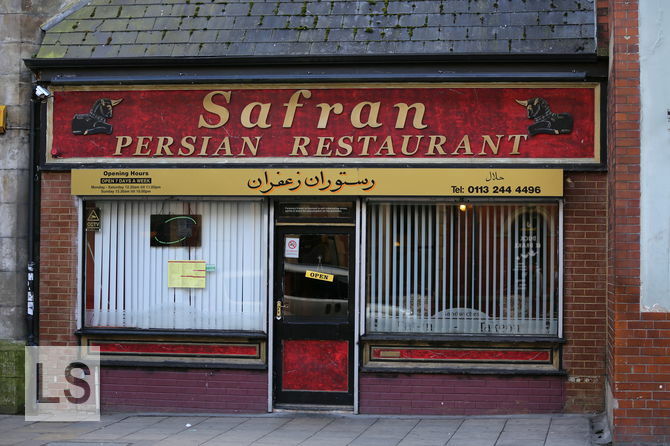 With loads of traditional Persian dishes on offer if you’re into Persian cuisine, or want to try something different – Safran should definitely be your next stop. It doesn’t look like much from the outside – but the food is to die for. Probably my favourite drinking spot in the whole of Leeds. Friends of ham has got everything perfect. The entrance area has a great feel to it, even with it being small in size – in fact I think that adds to it, creating a cosy welcoming atmosphere. The downstairs to FoH is heaven; loads of comfy chairs, dim lighting & bookshelves galore. One of the cosiest spots ever – be warned though, you’ll never want to come bak upstairs. The food is fantastic as well, with the menu being rather full of pig-based foods as you come to expect with a name like Friends of Ham. Check our their website, with their food & drinks menu and lots of lovely reviews on it here. Don’t forget to check out Leeds List for more, this is just a very small selection of the independents in Leeds.